Skiing is upon us, it's time to go for a walk!! 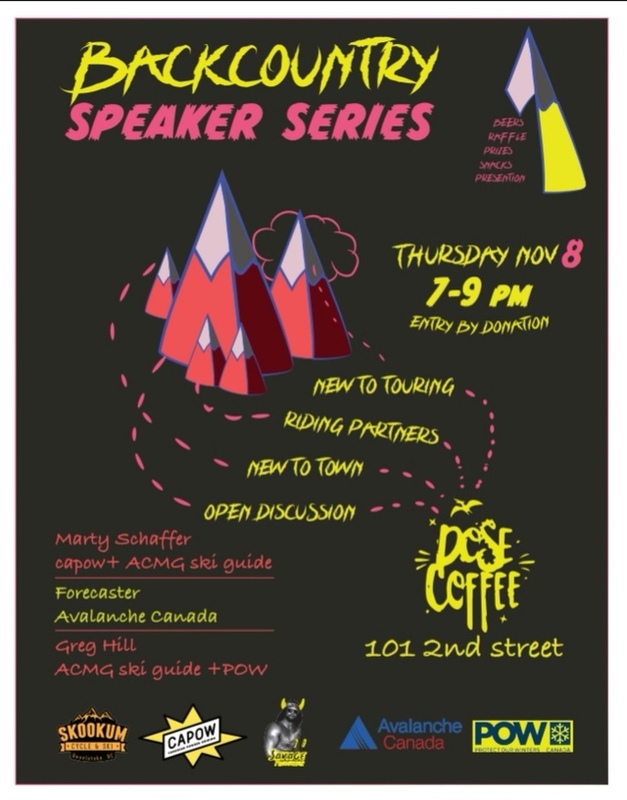 Tomorrow night, 7-9pm at Dose Coffee shop we are hosting the first of a series of backcountry skiing related presentations. Whether you are thinking of heading out into the backcountry for the first time this season or are already an experienced ski tourer and are new to town and looking to meet some ski partners this evening is for you. There will be three short presentations. CAPOWs head honcho - Marty Schaffer. The man who ski toured 2 million feet in one calendar year and environmental advocate - Greg Hill. Along with an avalanche forecaster and representative from Avalanche Canada. Followed by an opportunity to direct any ski touring related questions you might have to our presenters. Entry is by donation with all proceeds going towards the CAPOW fund and Protect Our Winters. There will be a raffle. There will be beers. There will be delicious Dose snack treats. And a great opportunity for everyone to make some new friends and find some ski partners for this winter.